First Goalscorer betting is one of the most popular types of bet on a football match and at Betbubbles we have compiled a comprehensive guide on how to bet on First Goalscorers to maximise profits. The premise of a First Goalscorer bet couldn’t be easier, you simply select the player that you think will open the scoring in a particular match and the bookmaker offers you odds on that happening. If your bet wins then you win back your stake multiplied by the odds. There is also the ‘fun’ aspect of backing either your favourite player or a player that you feel may be overlooked by the odds compilers. There’s a real satisfaction in getting a First Goalscorer bet correct and as much of that is getting one over on the bookies as it is cheering a player you enjoy watching hitting the back of the net. 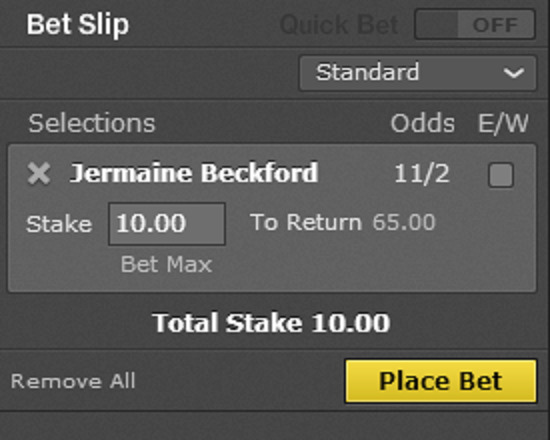 Placing a First Goalscorer bet is a very simple process. Most online bookmakers will do all the hard work for you, all you need to do is navigate to the match that you want to bet on and click on the First Goalscorer market, usually it’ll be one of the ‘featured markets’. An example of a Bet365First Goalscorer marketAfter selecting your player, you simply fill your stake into the betting slip and place your bet. 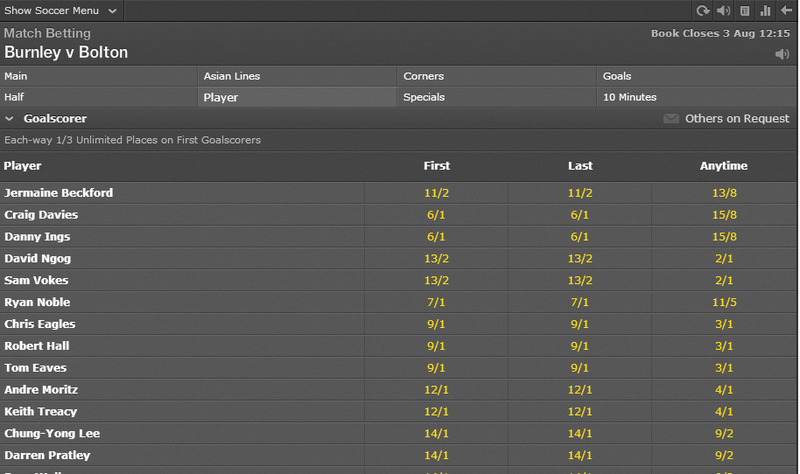 One thing to be aware of when placing a First Goalscorer bet is the option to place your wager Each Way. The stakes will be split between the First Goalscorer selection and your player to fail to score first but to score at a later point in the match. Check out your particular bookmaker’s First Goalscorer betting rules to be sure of the place terms. There are various tactics to use when placing a First Goalscorer bet, with different punters opting for different techniques. Some people like to go with the club’s leading scorer or the favourite in the market for an important game, using the logic that the cream of the crop will rise to the occasion. That can prove profitable if the matches are chosen very specifically but in general the short priced favourites will be losers over the course of a season. This can open up betting opportunities for savvy punters. If you are a regular watcher of Tottenham Hotspur and have noticed that Gareth Bale and Jermain Defoe have opened the scoring in 80% of their matches, and there is a firm that are refunding losing bets if Bale scores first, then there is an opportunity to back Defoe to be the First Goalscorer.